This 750m bi-directional bike lane along Harbour-Lakeshore Blvd W. (between Bay and Rees Streets) was the only new downtown addition in 2018. The final Bike Plan numbers are in for 2018 -- and they are not pretty. It’s hard to call 8.7 km of new bike lanes “progress” given our road network measures over 5,600 km. Almost three years into the new plan, we’re not much closer to achieving the 335 km of new on-road infrastructure to be installed in the ten-year timeframe. Yes, it takes time to plan new bike lanes, but it only takes seconds for a cyclist’s life to be violently ended. Five of our fellow city residents were killed --- the worst toll since amalgamation (1998) --- and many others have been seriously injured while riding bikes in the city last year. We need infrastructure - in the form of protected bike lanes that connect to each other - now. The new bike lanes installed in 2018 are mainly in three neighbourhoods, albeit without connections on nearby arterials where cyclists face greater danger. At York University, a cycle track was added to Shoreham Dr. but no improvements were made on nearby arterials Jane, Keele, or Sheppard. Large gaps (this one near The Pond Rd) remain in the nearby Sentinel Rd. bike lane at York University. 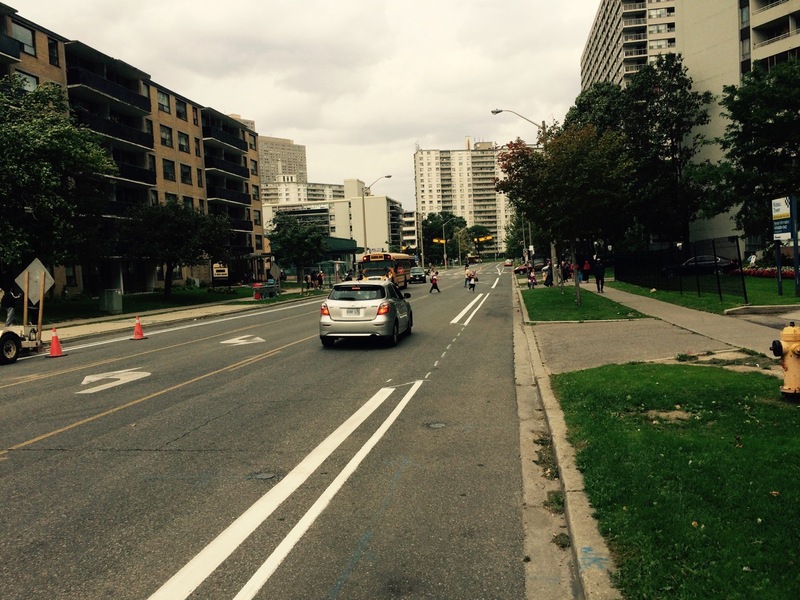 In the Flemingdon and Thorncliffe Park neighbourhoods, the new bike lanes avoided Overlea Blvd. and Don Mills Rd., which could have helped residents on bikes get beyond their own neighbourhoods. Bike lane along Thorncliffe Park Drive, the longest of the new bike lanes at 1.4 km being installed in Sept 2018. The downtown core got a short, albeit well-constructed, bi-directional cycle track along Harbour St. and contiguous Lake Shore Blvd. W. (image at top). There was, however, no progress for the busiest cycling routes in the city along Bloor St. and Danforth Ave. despite the much-studied success of the Bloor bike lane pilot. Scarborough, despite its vast expanse and deadly roads, fared worse, getting nothing. North York remains a black hole for cycling infrastructure with an area the size of Guelph that has virtually no bike lanes. Ironically, Mayor John Tory opposes a bike lane on Yonge in North York as proposed in the REimagining Yonge initiative. A formal Bike Plan update was to be given by City Hall by the end of last year, but like the rest of the plan, it didn’t go according to plan. It would be good to know how much of (and how) the $16 million budgeted for the Bike Plan in 2018 was actually spent. When we tabulated the 2017 bike lanes for our Tracking Table, we assumed that moving forward, 2017 would become the low point given the paltry 9 km of new bike lanes installed. We were wrong. At the current pace of implementation – a total of 25 km since June 2016 – we won’t reach the 335 km goal until climate change extremes are regularly laying waste to our city. By comparison, the smaller City of Montreal, despite its colder climate, installed 57 km of bike lanes, including protected ones, in 2016 and 2017 alone. There were a few additions to recreational trails in 2018, including the Chorley Park switchback that gives cyclists access (shared with pedestrians) to existing ‘multi-use’ trails near the Brickworks and to the Don Trail. Work on filling the last (780 m) gap in the Martin Goodman Trail was also started, though not yet completed. This trail’s origins date back to the 1970s. 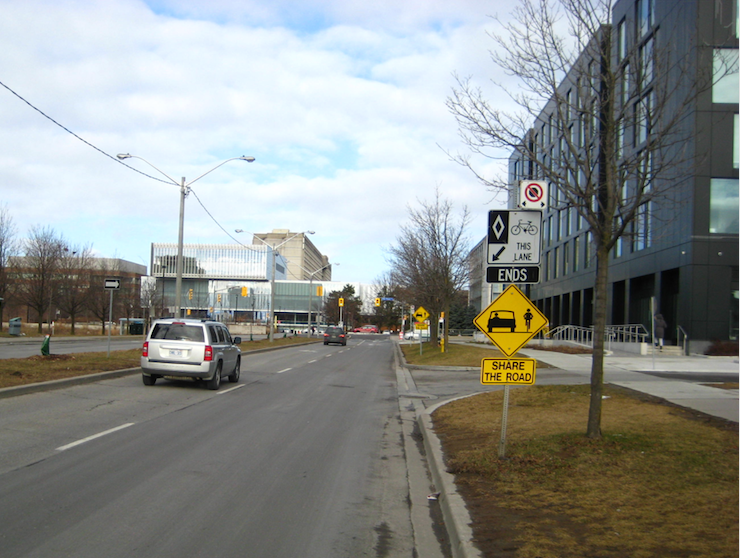 One of last year’s planned (but deferred to 2019) bike lanes was on Evelyn Wiggins Dr. – a 200-metre, residential roadway at York University. Cyclists, however, already have a superior option along the Finch Trail, which conveniently connects to Sentinel Rd. Indeed, cyclists would have benefited more if the major gaps in the Sentinel bike lane had been filled. York University bike lane (curiously) planned for Evelyn Wiggins Dr. has been deferred to 2019. The implementation pace of the current bike plan is disturbingly similar to that of the 2001 Bike Plan. That plan was preceded by intense study, then the announcement of big numbers, and followed by a lethargic pace of implementation that saw only 17% of planned bike lanes installed over ten years. 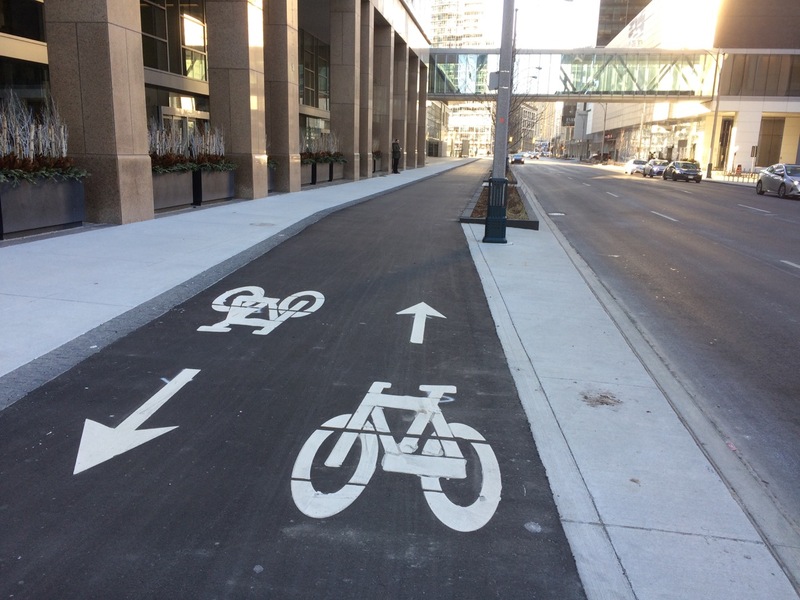 Without strong political direction, it’s no surprise that city staff in the Cycling Infrastructure Unit will be inclined toward the path of least resistance for bike lane installations, avoiding new lanes that provoke strong opposition. It’s troubling, however, that even a study (normally carried out by a consultant) for the Bloor bike lane extension from Shaw St. to High Park is stalled. First, the cycling community must be fully engaged in the process by which city staff set annual priorities. We need transparency. It’s clear that the existing process lacks any ambition consistent with Bike Plan targets. Cycle Toronto, which hosts annual advocacy forums and contributes to the bike plan consultation process, can engage the broader community in developing infrastructure priorities. We would likely have more success by identifying and rallying behind such priorities than making vague demands for Bike Plan implementation. Second, we need articulated measures of success and interim goals for the Bike Plan. How, for instance, is the new Dovehouse Ave. bike lane being received by cyclists? It’s not enough to simply count kilometres of new bike lanes. It’s clear that not all bike lanes are equal. 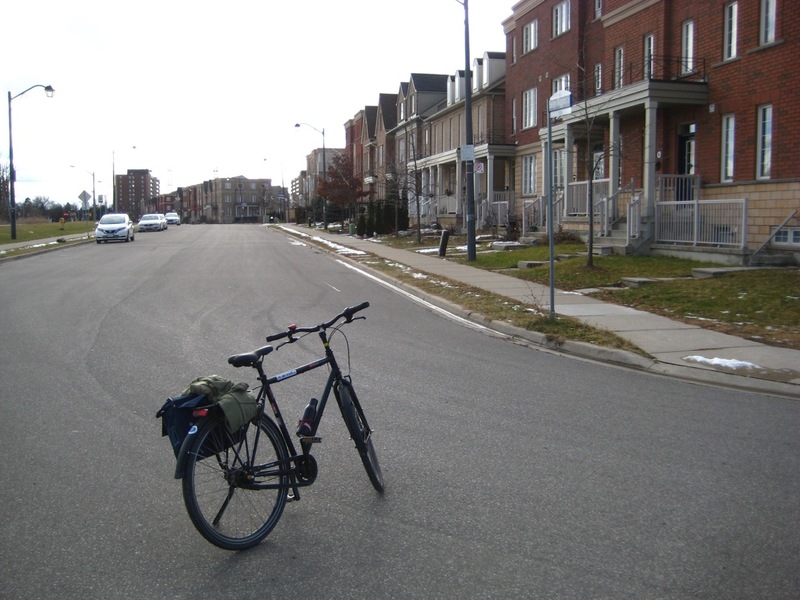 A bike lane in a remote part of the city with virtually no cyclists (the bike lane on Steeles near Pickering Town Line, for example) can’t have priority over popular cycling routes with growth potential. We certainly can’t wait for the end of the ten-year plan to see how it has fared. When interim goals are not met, a new approach must be taken. Finally, we need a City Hall politician who is accountable for implementation of the Bike Plan. When the Bike Plan lags there has to be an elected public official who answers to the public. This responsibility and accountability should be extended to include the Vision Zero road safety plan, which, sadly, is similarly far off course. This Google map below shows bike lanes installed since the new bike plan was adapted in 2016. Albert Koehl is an environmental lawyer and founder of Bells on Bloor. Robert Zaichkowski is an accountant and a Board Member of Cycle Toronto.